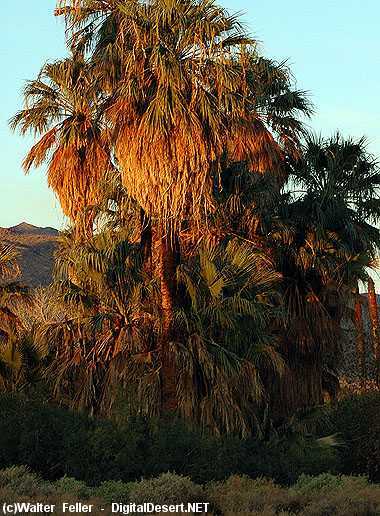 All natural or naturalized plant assemblages that include California fan palms are recognized as Palm Oasis habitats, cultivated stands of California fan palm are not considered Palm Oasis habitats. Densities of California fan palms vary from sparse scattered trees to dense, closely packed individuals. The vertical structure is usually well storied with fan palms towering over a subcanopy of smaller trees and large shrubs. California fan palms reach a maximum height of 25 m (82 ft). Grasses and shrubs may be found under relatively open canopies, although large stands generally have a sparse understory. California fan palm is the dominant species in the canopy. 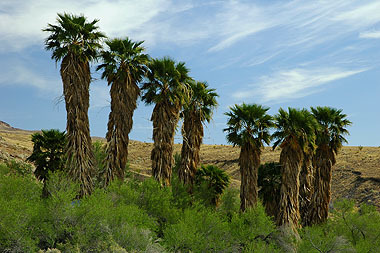 Occasionally, fan palms are associated with coyote willow, velvet ash, California sycamore, and naturalized date palms. Fremont cottonwood, mesquite, and tamarisk may also be present. Subcanopy plants include arrowweed, squaw waterweed, alkali goldenbush, and young individuals of species in the overstory. Forbs and grasses include alkali sacaton and wiregrass. California fan palms grow from seedling stage through young palm stage to mature trees. Only mature trees can reproduce. Most mature Palm Oasis habitats exhibit a relatively open canopy. Successful reproduction occurs after very wet winters. This response results in the "even aged" character of many palm oases. Reproduction may need to occur only once every 100 years in order to perpetuate Palm Oasis habitats. Fire opens up the understory, permitting fire-tolerant fan palms to become established. In addition, fire kills intolerant plants, such as mesquite, enhancing the water supply and releasing established shade-intolerant fan palms. As a result, palms grow very rapidly. Palm Oasis habitats are relatively long-lived; individuals may live for 200 years, though most probably die by year 150. 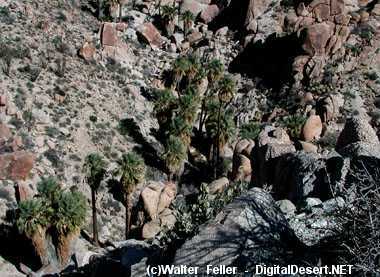 Most oases exist as a mature stage often associated with a dense understory of younger palms. 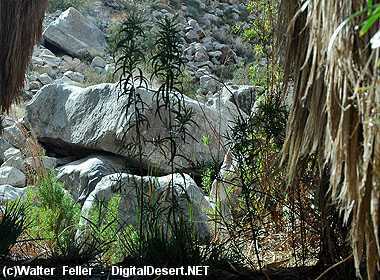 In many cases, characteristic plant species from these habitats comprise the understory of palm oases. Many wildlife species (e.g., Gambel's quail, mourning dove, bighorn sheep) are attracted to Palm Oasis habitats because of the permanent or nearly permanent water supply. Further, the additional foliage complexity of tall trees with broad-leafed, dense canopies provides habitat not normally found in the short, shrubby creosotebush assemblages that dominate southeastern California. Species such as hooded oriole are partial to palms for nesting. Palms are restricted to areas with permanent water or a water table that approaches the ground surface. Thus, Palm Oasis habitats generally occupy sites with moist alkaline soils near seeps, springs, and streams. The largest fan palm groves are along permanent streams or at large springs. 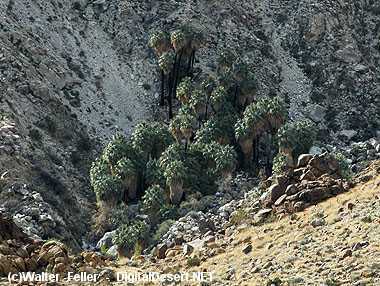 Palm Oasis habitats are also found on hillsides or in canyons, arroyos, or washes. Many sites are adjacent to faulting activity, especially along the San Andreas Fault, where underground water frequently emerges. Hot, dry summers and cool, moist winters are characteristic. Summer temperatures are warm to hot. At the Oasis of Mara, mean temperatures for June through September range from 28 to 32 C (82 to 90 F). On only 29 days of the year does the temperature drop below 0 C (32 F). Precipitation generally occurs in winter, though summer storms originating in the Gulf of California may result in precipitation. Rainfall ranges from 8 to 15 cm (3 to 6 in per year. Potential evapotranspiration exceeds precipitation by 10 to 15 times. Mammals of the Oasis � Reptiles of the Oasis � Cultural Landscape � Native American Life � The Old Well.